It was time again for our annual trek to Disneyland, for Bat’s Day In The Fun Park. There in the pic you have Miss E, the ex Mr. YP, The Handsome Cabin Boy, then there’s me, Miss S, our friend the nanosquid and miss L. We were a jolly crew! I came equipped for long lines and time spent waiting for other people to come off crazy rides. This was just before lunch and I think Miss E was a little hungry. Miss S, being a vegetarian, wasn’t trying to gnaw off my other arm, thank goodness. 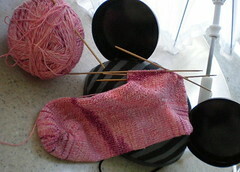 I actually got quite a bit done on the Charade sock. Well, a bit for me anyway. I am a slow knitter to be sure. I officially *love* the short row sock heel technique that I tried here. No holes. Nice and tight. Tutorial, here. It’s nice to refine one’s technique a little. We are doing a bit of a Ravelry/SnB/random fiber nuts meet up and spin in in Culver City, this Saturday the 25th. If you’re local, come join us! Other than that, I’m feeling a bit like I’m being nibbled to death by ducks these days, but that’s all minor. Everything important is really binjali so I shan’t complain. in 1983 they wouldn’t let me in Disneyland with hair like your daughter’s. Oh, how far things have come. Makes me want to head south for a trip to the Magic Condom/Tragic Kingdom/Dismalland. I grew up behind the orange curtain, can you tell?